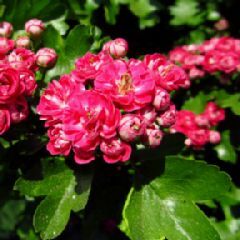 A reasonably small deciduous tree of an upright habit with clusters of double, scarlet blooms in May and June, borne in profusion. Robust and suitable for restricted sites. Height & Spread 8m (26ft), 20-50 years to maturity.